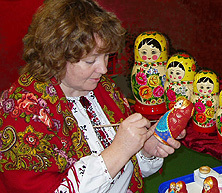 Babushka Netherlands specializes in the sales of Russian art and gift goods. Almost every item on this website is handmade by Russian and Ukrainian artists, among which those made by me. Besides keeping this web-shop I also give lectures on this aspect of Russian culture, give demonstrations of matryoshka painting and host workshops. I would like to introduce myself to you. My name is Larisa Bilous. I am a Ukrainian artist, living in the Netherlands since 2001. One of the most special gift items I offer is a customized set of matryoshkas with the portraits of you and your family. It is remarkable, that the faces drawn on those wooden dolls often remind their maker’s face. This often remains unnoticed by the artist. This happens due to the fact that the artist’s emotions, personal warmth and love towards art permeate his creation. Realizing that has brought me to an idea of making the matryoshka dolls with portraits of people. The very first set that I’ve made was of me and my children.